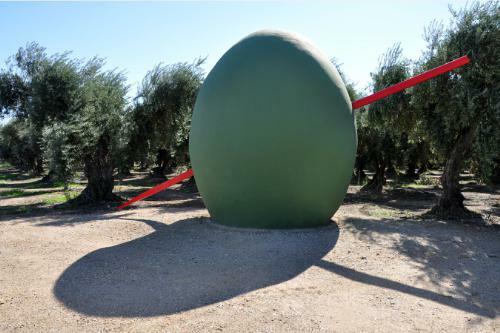 Gigantic green olive made from adobe and speared with a giant red toothpick made from steel marks the orchard of Corning, California-based West Coast Products-Olinda Brand table olive and olive oil company. Orchard owners commissioned the sculpture in recognition of California’s traditional olive industry. 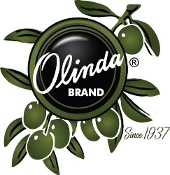 West Coast Products – Olinda Brand, a Northern California table olive grower and processor, today announced the completion of its 2013 harvest and cites an average crop yield with very strong quality. “We took in about a thousand tons, including 20 percent from smaller farms,” said Dan Vecere, general manager, West Coast Products-Olinda Brand. 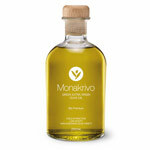 Olinda Brand olives are Sevillano (Seh-vee-yah-noh), one of the largest green specialty varieties sometimes called the “Spanish Queen,” and must be hand-picked to protect them from damage such as bruising. Approximately 40 agricultural workers harvested West Coast Products’ 88-acre orchard’s 7,000 trees in three weeks during the 2013 harvest. According to Vecere, the olive crop sizes were excellent this year. “With green Sevillanos we like to see the bigger fruit, which have stronger flavor and taste. Our customers will really enjoy the 2014 olive products since this season’s harvest included the best of the top sizes – super colossal, colossal, and jumbo.” Vecere emphasized that because of the natural curing process it takes 10-to-12 months to bring these olives from orchard to market. Harvest season also means the California table olive industry has a multiplier effect, which spurs economic growth noted Adin Hester, president of the Olive Growers Council of California. “When a company like West Coast Products-Olinda Brand purchases olives from the smaller ranchers (less than 20-acre parcels) at several hundred dollars a ton it pumps hundreds of thousands of dollars back into the economy and leverages spending and growth in the state,” said Hester. Nearly half of the table olives in California are grown in the Sacramento Valley. Industry leaders report table olive production in Glenn County, where West Coast Products-Olinda Brand is situated, surpassed the $20 million mark in 2012. About West Coast Products and the Olinda BrandSince 1937, West Coast Products of Northern California has provided professional and home kitchens with specialty olives and olive oils under the Olinda Brand. The company’s commitment to natural, fresh, and in-season premium private-label table olives and private-label olive oils meets the highest standards of California state certification, which ensures top quality olive products.